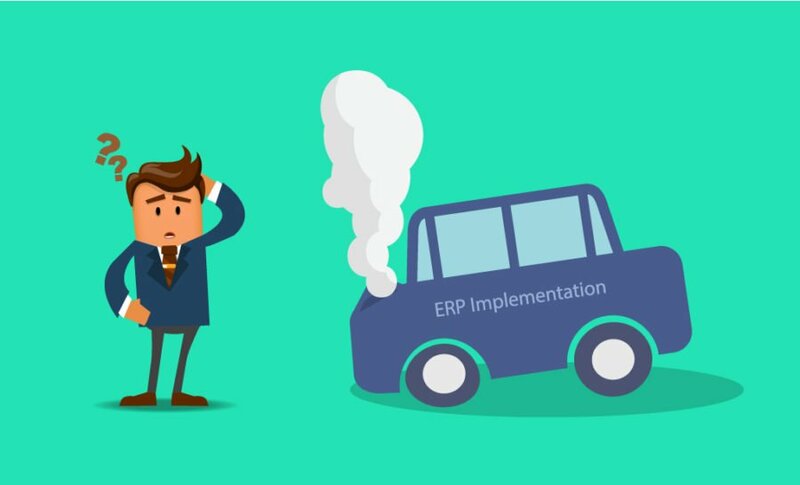 Implementing an ERP for a manufacturer is like changing the wheels of a car while it is in motion. Manufacturers specially from Small & Medium segment cannot afford to stop production and therefore, the implementation should happen alongside business as usual operations. Considering the limited budget, time and manpower, it is but natural for manufacturers to rush into completing the implementation at the earliest. However, haste along with the inexperience of implementing an ERP can lead to grave errors that can derail the implementation. We will highlight each error in more detail so that you can avoid them. Organizations have a common misconception that implementing an ERP will magically improve all their business processes, workflows and increase their efficiency overnight. An ERP automation provides an opportunity for organizations to re-evaluate their existing processes, improve them for efficient & speedy operations. There is always scope for improving existing processes and if they are automated as is, the organization tends to run with the same limitations, but a lot quicker. Therefore, a thorough planning is needed where, the organization can outline the scope of implementation, processes & workflow improvement, infrastructure upgrade, data transition, key impact areas, total implementation time, managing business disruption etc. More importantly, if an ERP is even required. A comprehensive planning keeping in mind, existing challenges and its resolution will provide a roadmap to a successful ERP automation. Nowadays, ERP software have evolved from just being a combination of Finance, Inventory, HR, Sales & Purchase modules to being an advanced technological system. Today’s ERP software can be deployed anywhere, accessed from everywhere, have in-built manufacturing intelligence that provides real-time information and can be easily integrated with third-party and internal applications. Therefore, a thorough ERP evaluation from various vendors both large/renowned, mid and small segment vendors is absolutely needed. A common practice for organizations is to approach vendors based on recommendations from employees, well-wishers, other vendors etc. and seal the deal without evaluating their product. You surely do not want to end up with an ERP that wouldn’t solve your problems but complicate it further. And moreover, lead to an immense loss of time, money, manpower and business operations. A workforce comprises of management, senior executives, mid-level managers and floor personnel. The floor personnel are the ones who thoroughly know their respective processes along with the scope of improvement. Usually, more time is spent in taking necessary approvals from the management and convincing them about implementing a particular ERP or a specific feature. This time can be more utilized in meeting ground-level employees from all departments and appraising them about the implementation, hearing their inputs on improving processes at floor-level, listening to their grievances, apprehensions and ensuring a constant communication for accurate decision making. Their conviction reflects in their day to day work as they will be more enthusiastic to participate in the implementation and make it successful within their respective department. Also, each employee should be included into the project based on their skill sets and experience so that the learning curve is small and the implementation proceeds without any delay. How can you easily handle the Human Element in an ERP Implementation? Today, a manufacturer has a choice to deploy an ERP on their factory premises or their private or a public cloud. Before choosing a deployment method, it is important to understand their pros and cons. On premises setup requires a stand-alone dedicated IT team, array of servers & communication hardware, a dedicated hosting area, high one-time infrastructure cost etc. On-premises setup is justified if the evaluation says that it is absolutely necessary based on the organization goal & business strategy. No manufacturer would want to invest heavily and later realize that it isn’t sustainable for their business. However, there is an advantage where the on-premises system can be easily customized and integrated with internal & third-party applications. .
A cloud setup is hassle free where the entire hardware platform lies with the cloud vendor and the costs are less. However, most cloud platforms are rigid and do not allow for any customization & integration with legacy systems. It will need third-party applications, delicate workarounds or any other alternative methods to keep everything integrated and running. Many organizations want to finish implementing the ERP at the earliest and most often, choose the big bang approach i.e. implementing the ERP all at once. While this approach definitely cuts down time, costs and ensures quick ROI, the flipside is that disrupts normal business operations, suited only for Small enterprises, and carries a big bag of uncertainty. In case of a setback, reverting to the old system will be difficult and will take unaccounted number of days leading to considerable loss in production and revenue. Considering the new-age ERP technology and the dependency on various other systems to keep the system well-connected and integrated, a phased approach is the best option. How to choose an Implementation method for your organization? Right from the word ‘go’, the management and senior executives expect the ERP to be implemented in a speed unthinkable of and want to see the results at a flash. It is natural for them to do so as lot of money gets invested into this project and they would want to see its returns. However, it is prudent to understand that an ERP implementation is a slow process and the focus should be on implementing it right across the organization and not worry about instant results & ROI. It is natural for everyone to be neck-deep into day-to-day operations and the ERP implementation simultaneously without realizing the need to communicate important changes with each other. Lack of communication is one of the major reasons why implementations fail and it can happen at any department and hierarchy level. The senior most executives running the implementation are primarily responsible to send crucial bits of information to every employee across the organization. Similarly, they need to be aware of ground-level issues and activities for correct decision making. An ERP implementation means a landmark shift for a manufacturer in terms of people, process and technology. While the technology and processes can be overcome with the right planning, the people part needs careful treading. An ERP implementation often brings speculations and insecurities along with it. Employees ponder over their future in the organization and start resisting the change. Communication plays a key role here, and they need to be convinced about the implementation through fair means. Also, a clear road map needs to be shown to each employee about their future in the organization and what skill sets they would need to learn in order to stay afloat and grow. Only a robust Change Management process will help minimize resistance to change and overcome key transitional challenges. How can you minimize business disruption during an ERP implementation? An ERP implementation is a once-in-a-lifetime event for any employee within the organization and also a huge learning curve for the manufacturer. If done right, it works wonders and positively affects each and every person in the organization. All it needs is thorough planning and seamless execution that can keep the above mentioned mistakes at bay.